Software is currently available for Windows and Linux. As a moving object passes through the photogate, the object briefly interupts the IR LED beam, preventing light from reaching the phototransistor. Once the object has completely passed through the photogate, the IR LED beam is no longer interupted and light reaches the phototransistor. 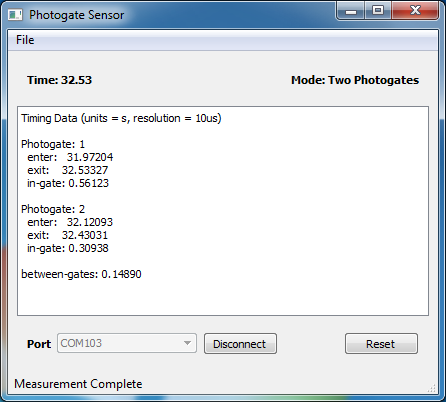 The photogate software reports the time in seconds when the photogate IR LED beam is interupted i.e. the object entry and exit times. Time in gate - Time for the moving object to completely pass through each photogate, i.e. difference between entry and exit times. Time between gates - Time for the moving object to pass between gate 1 and 2, i.e. difference between Photogate 1 and 2 entry times. These values can be used to calculate the velocity and acceleration of a moving object. For example, experiments to determine acceleration due to gravity, (see Freefall - calculating g) or acceleration of an object on an incline (see Inclined plane - rolling ball). Software can be used in both “One Photogate” or “Two Photogate” mode. 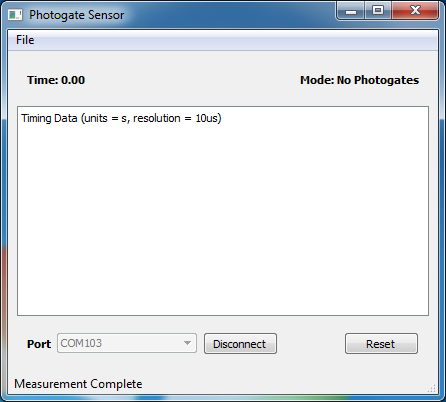 Photogate auto-detect function automatically selects the correct Operating Mode. Data can be saved in 3 different formats. Matlab (.mat), Comma separated values (.csv) and plain ascii text (.txt). When used in Two Photogate Mode, Photogate 2 remains inactive until Photogate 1 is activated. Timing reset function. Click on the Reset button anytime to clear data and re-start the photogates. Note that any data will not be saved. Download and launch the photogate software. The screenshots shown here were taken using the photogate software for Windows. 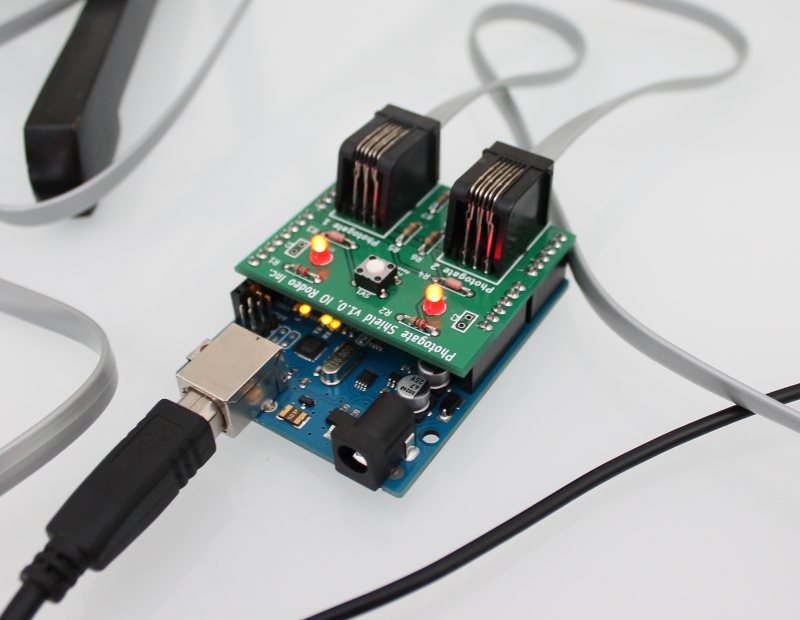 Connect the Arduino to the PC with the USB cable. In the photogate software screen, select the device port from the drop-down menu. The photogate software automatically detects all available serial ports so you should be able to select from the drop-down list. Connect the photogates to the Arduino shield. The software auto-detect feature automatically detects the number of photogates connected and selects the operating mode. As shown in the screenshots below, mode should change from “No photogates” to “One photogate” or “Two photogates” Additionally, on the Arduino shield a red led will indicate once the photogates are connected. That’s it ! You are ready to start using the photogates. On the next pages are some examples of using the photogates.